Thank you for considering Hi-Tech Stencils, Inc. for all of your stencil needs. When we were founded in 1996, we originally used chemical etching to manufacture our stencils. In order to meet the critical demands of the industry, we have completely transitioned to using laser cutting technology to efficiently produce the highest quality stencils possible. We are proud to provide competitive prices and can guarantee that they are the lowest prices found anywhere throughout the country. Just provide us with either gerber data or art works, along with any special instructions, and we will begin stencil production immediately. Hi-Tech Stencils, Inc. not only hand delivers your order anywhere within Southern California, but also ships out orders to anywhere in the country within the next business day. Hi-Tech Stencils, Inc. is completely committed to understanding the needs of our customers. We guarantee 100% quality satisfaction, 24 hour service, 7 days a week. If you are not satisfied with your order for any reason whatsoever, we will remake your stencils within 8 hours, day or night, rain or shine. That’s dedication that no other company would dare commit to. At Hi-Tech Stencils, Inc., your satisfaction is our foremost priority. We will do whatever it takes to meet your company’s demands. We value each of our customer’s patronage and reciprocate with an eagerness to build a long lasting relationship built on customer satisfaction. You can rest assured that this is a commitment that you can rely on for years to come. 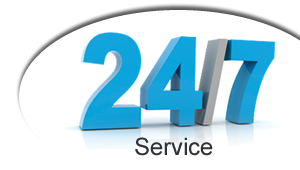 24 hour service. 7 days a week. Our management team is constantly on call all throughout the day to ensure that your orders are promptly processed. If you ever reach our voicemail, we guarantee that one of our team members will respond to you within minutes of your call. At Hi-Tech Stencils, quality is our first and foremost priority. At Hi-Tech Stencils, we are constantly searching for new methods to improve the quality of our products.